View More In Fish & Aquatic Pets. When quality determines the choice, the choice is clear: SeaClear. No one can match the quality of SeaClear's virtually invisible seams, which are backed up by the industry's most extensive warranty. For the discerning aquarist for whom nothing but the best will do, SeaClear can make even the most extreme aquatic dreams come true. Product Features: *Combo means: the aquarium, reflector and electrical light fixture are all included * Acrylic is clearer than glass fish tanks * Acrylic is 17 times Stronger than Glass * Weighs half the weight than glass * More Impact Resistant making it less prone to chipping or cracking than glass, making it safer around children and pets * Safe for Salt and Freshwater * This SeaClear Aquarium is beautiful and you won't believe how your fish and decorations will pop when viewing your aquarium. 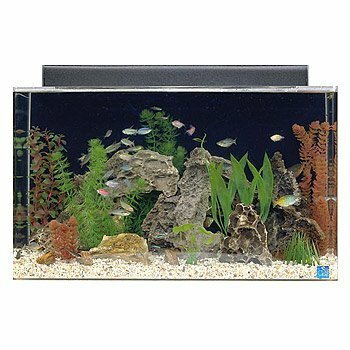 Acrylic aquariums are clearer than glass, 17 times stronger, and only half the weight! If you have any questions about this product by SeaClear, contact us by completing and submitting the form below. If you are looking for a specif part number, please include it with your message.